Noteflight Premium gives you the full range of features in Noteflight's award-winning notation software that runs in any web browser. Create, view, and print unlimited scores and parts, then hear your music with over 85 professional quality instruments. Use the audio mixer to customize playback, enjoy MIDI note entry, and share your scores with individual Noteflight users. Unlike traditional notation software with expensive and time-consuming updates, Noteflight is always up to date every time you use it and scores are always compatible and shareable. Sell your arrangements and original works on Noteflight Marketplace! 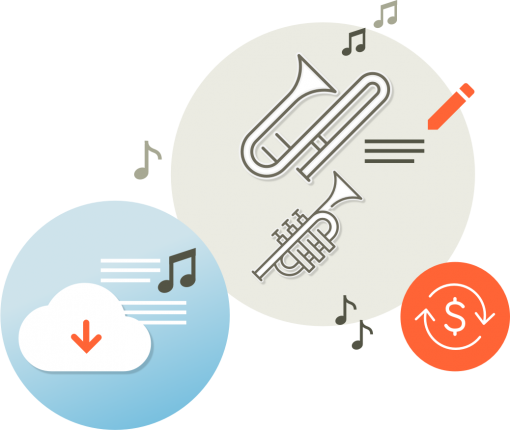 Search the Marketplace Song Catalog for copyrighted songs allowed to be arranged. Create all the scores you want with Noteflight Premium. Start from scratch or use our score templates and quickly create beautiful performance materials to share your music with other musicians. With over 85 high-quality instrument sounds and a built-in audio mixer, you can adjust volume and mute or solo individual parts to customize the playback experience. This makes Noteflight Premium an ideal solution for learning, composing, notating and listening to scores. Sharing and collaboration features are built into every aspect of Noteflight Premium. You can share scores with individuals, with groups, or with the entire Noteflight community. The score owner is always in control; you can set access to each score in your account for viewing only, for viewing and commenting, and even for other users to edit your score, which is essential for collaboration. Music is a collaborative art form, and Noteflight Premium makes it easy to share not only the finished result, but the creative process itself. Perform mode quickly formats scores and parts for full-screen viewing and page turns, and provides an easy way to view, play, and record along with scores. Muting or soloing various parts is a powerful practice tool, allowing you to play along with any combination of parts in the score. Use live audio recording or media sync to share your music with your own performance recording included! Noteflight Premium is sold as a monthly or yearly subscription. The price is $7.95 per month or $49 per year and you may cancel within the first 30 days for a full refund if you're not completely satisfied.